CLOSE UP: Baby girl swipes her tiny finger across the screen of a cell phone. CLOSE UP: Proud dad and his cute little daughter blowing bubbles in the park. Energetic dog rips apart an blue toy during playtime with owner. Playful swiss shepherd dog pulls on toy while having fun outside. 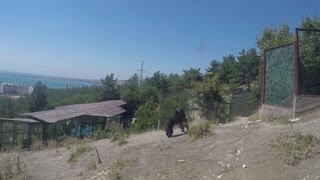 Cute puppy and owner enjoying in summer. Two young children dressed in homemade superhero costumes play fight in their backyard garden. A boy plays in the leisure center of a large shopping center. Many interesting educational games attract baby. Child having fun with a sparkling flare at sunset. Happy kid enjoying on the beach with full moon over the sea. Infant enjoying the bengal game by the sea at dusk. Ukraine, Kiev 17. 09. 2017. 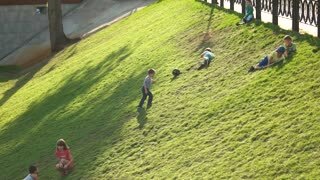 Kids rolloing down the hill. Having fun on the grass in the park. 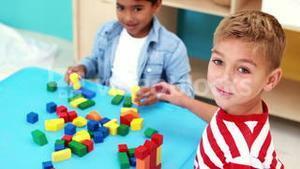 Close-up of multicolored plastic constrution toy blocks lying on table with blurry group of diverse multi ethnic kids playing on background. 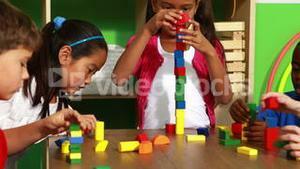 Preschool kids building out of bright constructor bricks. 4k, Grandfather helping his grandson with building a cardboard toy. 4k, Shot of a grandfather with his grandson building a toy together. Red, Blue and Yellow plastic child slide in the rain on green grass in courtyard. Sad and gloomy rainy day. No playtime. Lonely.